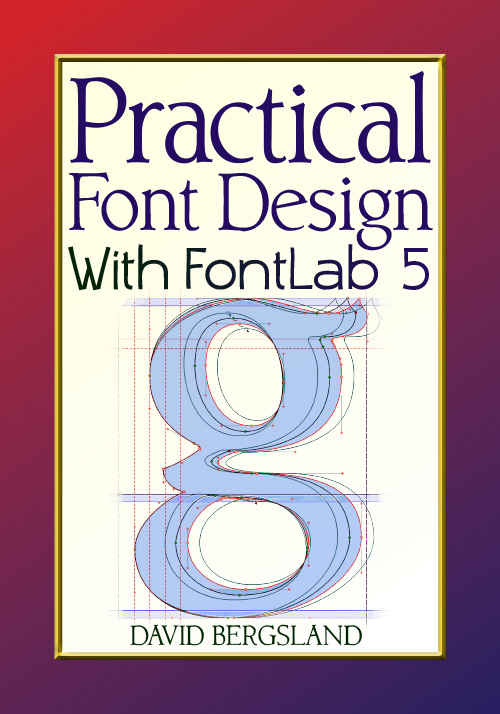 These are all pieces mentioned in Practical Font Design which I have developed to help you get started. They are copyrighted. You are free to use them, but not to sell them. They’re from an earlier book and I’m not sure what they are any more. Here’s a list of composite glyphs in the 8-bit list you will need to generate after you have the caps and lowercase glyphs designed. You will also need to have the accents completed. 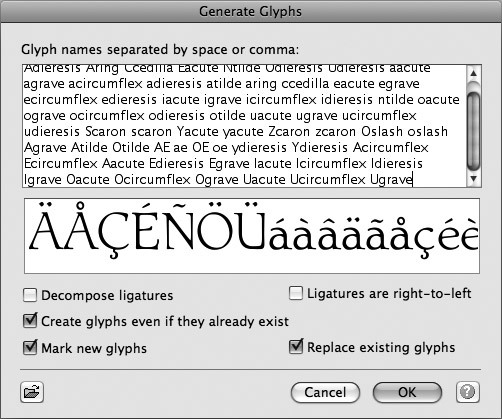 FontLab changed this so you now need to download a txt file and add it to the Generate Glyphs dialog. Go under the Glyph menu in FontLab and choose Generate Glyphs. Copy the text in the file in the list found and paste into the dialog as seen below. Set up the dialog box as you see and click OK. The link above gives you a complex feature set. Here are two additional feature sets that are more limited. One for display and one for bold italics. In both of these cases, I am convinced that fancy features are not used so I do not take the time to generate the glyphs. The bold italic set, for example: drops the small caps, numerators, denominators, swashes, ordinals, and some of the discretionary ligatures. This will aid you in setting your basic letterspacing as well as providing hundreds of potentially problematic kerning pairs for you to adjust, if necessary.